Depending on who's asking, George hails variously from England, Tanzania and Texas, and to simplify matters further, he spent his teens living in India and Malaysia. After winning a first BA Film & Theatre from the University of Reading, George moved to London to pursue acting. 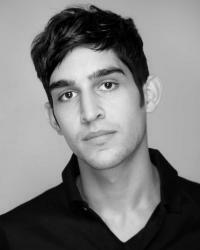 He has been active on the fringe, taking on roles in The Cross Project (Rock Theatre); Get Aladdin! (Above the Stag); Mad Women and All Hidden (Barefaced Theatre); and Crime and Corruption (Theatre Collection). Most recently, George premiered and toured Absent Theatre's On Beauty to Avignon, France. Penthesilea with Playades will simultaneously be George's Edinburgh Fringe Festival debut and UK swan song, as he leaves for the States this September to attend the Stella Adler Studio of Acting in New York City.